A progression that has been evident for decades in the Middle East's upstream sector has taken hold in the region's downstream. With the majority of the Middle East’s downstream projects slated for completion in the next five years, joint ventures (JVs) will not only remain a trusted route but will be crucial to the success of these plans. National oil companies (NOCs) in the Middle East have historically relied on foreign support for hydrocarbon exploration and extraction, awarding financially strong international oil companies (IOCs) lucrative concession deals for onshore oil rights. New fields were discovered, billions of barrels of oil were produced, and the local workforce grew in parallel. IOCs continue to play an important role in the development of the regional energy sector. However, the market has dramatically shifted with NOCs building up their financial and technical resources, and enabling themselves to self-fund projects of any size. Today nearly 85 percent of global oil and gas reserves are controlled by NOCs, compared to just 15 percent in the 1970s, according to Martin Bachmann, Wintershall board member and head of exploration and production in Europe and the Middle East. Indeed, doing business with IOCs now depends more on their technological competence and access to international markets rather than their balance sheets. In many ways, the Middle East’s downstream sector is re-living the progression that its upstream counterpart witnessed over the last few decades. Being a relatively new area for petrochemical producers in the region, who have just started to expand into downstream products, the need for technological expertise is at its peak. An easy solution would be to hire engineering and procurement companies to build and operate the plants, but that approach does not address the need for knowledge transfer – a priority for most Middle East nations. This is where joint ventures with IOCs can be advantageous, and it explains why such partnerships have been the most preferred route taken so far – particularly in Saudi Arabia, where petrochemical producers want to create manufacturing clusters and convert products on-site. For example, Dow Chemical/Saudi Aramco’s Sadara Chemicals Complex – the largest chemical complex in the world to be built in a single phase – is largely benefitting from Dow’s experience. More than 475 apprentices and 235 on-the-job trainees underwent manufacturing and engineering training programs at Sadara last year. By the time the chemicals complex begins operation in 2016, the JV predicts it will have created more than 20,000 jobs for Saudi nationals. Sadara’s success is not an isolated case. Saudi Arabia Basic Industries Corp. (SABIC), one of the world’s largest petrochemicals producers, has created a system of partnerships with global industry leaders that the company describes as central to its business growth and advanced manufacturing plants. According to SABIC, the company “offers a share in its resources in exchange for technology and expertise in human resources and global marketing.” Straightforward as it may be, the business model sums up the drivers behind NOC-IOC partnerships in the downstream sector. “My experience has shown that NOCs want to tap into new production markets instead of just reigning over their traditional territory,” said Bachmann. “They don’t just want to buy innovative technologies – they want to use them. And they want to benefit from the relationships and networks that IOCs dispose of in their countries of origin.” Bachmann offered that insight during the 5th Gulf Intelligence UAE Energy Forum 2014. From the perspective of IOCs, training and hiring nationals is often a mandatory part of their agreements with the host countries – although companies have come to realize the benefits of recruiting locally. 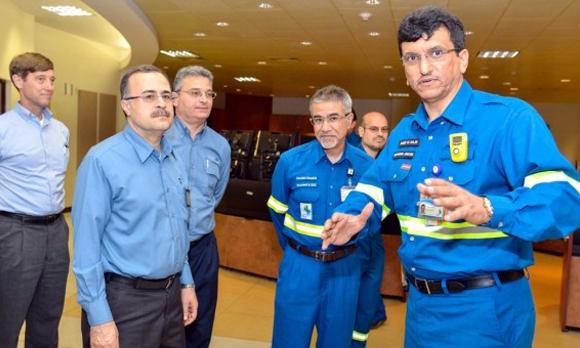 Downstream JVs are providing training and job opportunities for nationals in the Middle East. “We have 92,000 employees globally, and more than 400,000 contractor staff. We recruit and train local people. While this can be a government requirement that allows us to operate, we also do so because it makes good business sense,” Andrew Vaughan, vice president for Abu Dhabi, Kuwait and Syria at Shell Abu Dhabi BV, told Downstream Today. Shell sees two main drivers for its long-term presence in Abu Dhabi, where it has operated for more than 75 years: partnership and sustainable development. On a practical level, the company achieves those ends by supporting its partners – the Abu Dhabi National Oil Co. (ADNOC) and its group of operating companies – by providing cutting-edge technology, the secondment of experienced staff, as well as training of UAE nationals, either through courses or by cross-posting staff to Shell companies around the world. “The outlook for engineers pursuing a career in the energy industry in this region is positive, especially considering that 40 percent of the world’s gas reserves are located in the MENA (Middle East and North Africa) region,” said Vaughan. 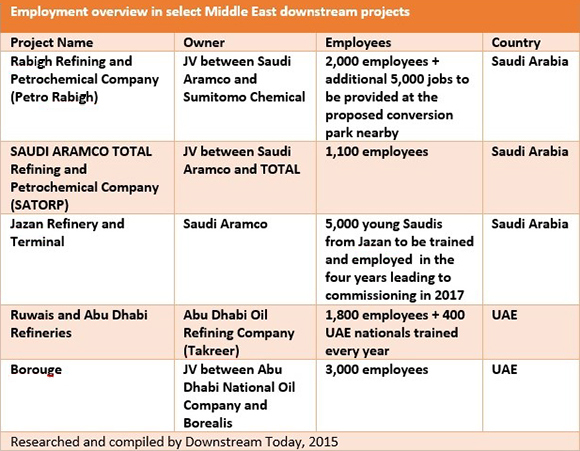 Planned Mideast projects reflect the region's emphasis on downstream. Earlier this year, Abu Dhabi’s Senaat, a state-owned industrial holding company, announced its intent to invest approximately US$1.36 billion over the next two years to develop downstream industries. Similarly, Saudi Arabian Industrial Investments Co. is planning for a $2 billion investment program in the next five years, targeting conversion industries that rely on the non-oil manufactured products, including petrochemicals, plastics and steel, according to a report by Saudi Gazette. Saudi Arabia has in fact set an ambitious downstream program that will see its refining capacity rise to 8 million barrels per day (bpd) by 2024. Four new, export-oriented refineries recently came online in the kingdom through partnerships between Saudi Aramco and foreign companies, complementing the country’s nine existing complexes. Additional projects are underway, including Aramco’s $7 billion Jazan Refinery and Terminal, set for completion by late 2016. Moreover, Aramco recently signed $5.2 billion worth of loans for the expansion of the Petro Rabigh Refinery, a joint development with Sumitomo Chemical. Like Saudi Arabia, Qatar also plans to increase its output of chemical and petrochemical products to reach 23 million tonnes by 2020. Last year, the state’s petrochemical portfolio consisted of 19 million tonnes of capacity, earning up to $11.5 billion in revenues from the manufacture of products such as fertilizers, plastic and fine chemicals. As Middle East countries continue to profit from higher-value downstream products, joint ventures will become an even more attractive route, offering both sides the chance to multiply their strengths and create win-win situations.